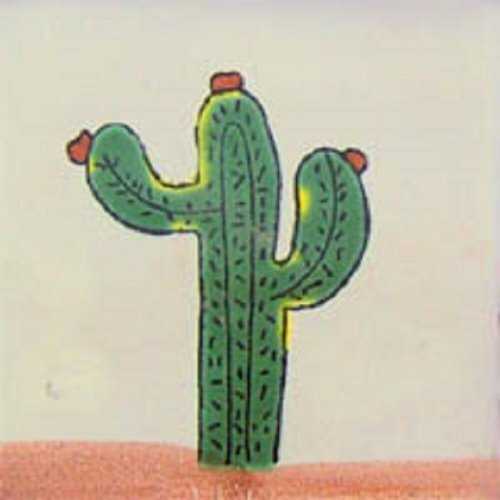 Mexican tiles in "Cactus" style. Vintage with green, terra cotta and black red clay tile pattern over white background. Shipping from Mexico to the US and Canada is estimated for four weeks. Needed accent tiles for my kitchen wall and found this talavera tile with cactus. My house interior is in Southeastern style despite the fact I live up North. I like warm whether and decorating that way was to remained myself there are places in the US where is still warm :-). I guess I relocate one day when retired but that is a different story. Apart of this cactus accent tiles I also purchased from them plain white color kind of rustic field tiles and install them (contractor did) on my backsplash. They look good, I am happy customer glad to award five star review for tile quality and service I received. Mexican Tile "Rancherito under Sun"